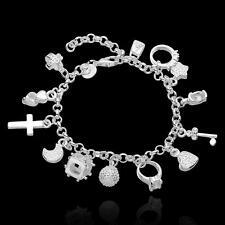 Charm Bracelet Material: Rose Gold Plated Stainless Steel. 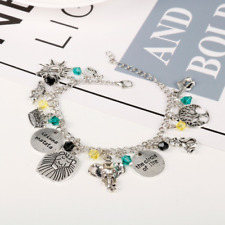 All our charm bracelets are UNIQUE as we source quality charms from across the world to allow us to design a beautiful range of charm bracelets for all tastes. Ladies or Men's Leather Wrap Bracelet, Personalised Engraving on Heart Charm. 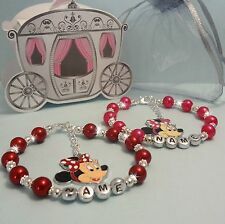 Birthstone Bracelets with Engraving for Girls, Personalised Jewellery Gifts. 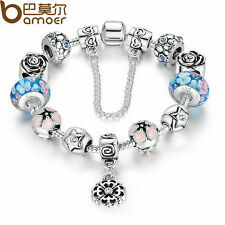 Girls Silver Plated Flower Charm Bracelet -Peach Charms. LOBSTER CLAW CLASP ENABLING YOU TO ADJUST LENGTH TO REQUIRED SIZE. 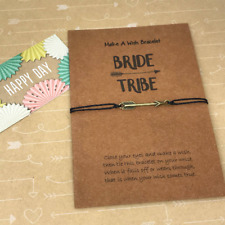 EACH HANDMADE CHARM BRACELET MAY HAVE A DIFFERENT ORDER OF CHARMS THAN THE ITEM LISTED. TREASURE CHEST. 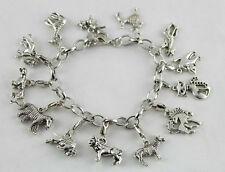 SILVER TONE BRACELET APPROX 8". Antique silver tone chain with toggle clasp. Silver toggle clasp for easy fastening. Includes a mix of Tibetan silver, glass, ceramic and rhinestone beads. 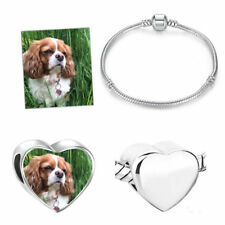 Your bracelet will be supplied in an attractive jewellery bag. Various Handmade European Style Bracelets With Lampwork & Tibetan Style Beads.